I wrote this quote in my bible over 20 years ago. At the time that I wrote it, I felt so spiritual. I loved all the quotes that pointed to a deeper Christian life. Isn’t it funny that I could revel in the spirituality of these words while at the same time overlooking this simple fact? If I talk the talk, I will walk the walk. Anything other than that is hype. This quote is so real to me that I can feel its sting every time I read it. I walked it out. Being a people pleaser in addition to an angry control freak, I would reject before I was rejected so that I did not have to deal with the pain. Or I would control so as to not encounter situations or circumstances that knocked me off my pedestal or position. That all did not last long. There was a time in my life where my hunger to know God increased dramatically. It was during this time that God called me apart. What does that mean? It meant that I could not be in the mix of things, keeping busy or distracted. He wanted to work on my heart. He did and still is. In pulling me out of the mix, I did not know that the journey to remove religious props was just beginning. The root was deep in me to constantly be affirmed by my preaching, my prophecy and the ministry. I loved being well thought of and highly respected. So in removing my source of affirmation, God ordained to withdraw praise. I don’t have time to go into great detail right now. This is only a blog. So just read these words and substitute your name in the appropriate places if any of this applies to you. Rather than receive praise, I suddenly was being criticized. There was a purpose to this, but I surely did not see it at the time. In fact, it flat out hurt. (Flat out is a Texas term my husband uses when he means that something is no-nonsense.) I repeat that this season flat-out hurt. Through situations and circumstances where I held my ground for what I believed, I was rejected. Those who I thought were my friends became the opposition. I don’t want to say they were my enemy. I simply can’t stoop that low or I become like they are in life. Many simply opposed me and any forward motion in my Christian walk. It hurt. How did it hurt? It hurt because I knew that God ordained this time to strengthen me and to purify my focus on Him. God touched on the fear of man, the deep wound of rejection, and total insecurity in my life. I loved Jesus and so willingly walked through it all. Do you know, and I am sure many of you do, how hard it is to accept pain in order to deepen and strengthen a relationship? It’s worth it. It truly is. Skipping ahead many years I realize now that Jesus Christ did indeed inoculate me from the praises of men, which are shallow and fleeting. They love you one minute and hate you the next. (Helllooooooo Miley Cyrus! Read what Sinead O’Connor has to say to her. I would listen girlfriend.) But when the inoculation of praise runs tandem with the baptism of criticism, the only thing left to do is cry, which I did a lot of those years. You know what emerged from those times, a woman of God, not a little girl anymore. Me. A new me – I won’t stand for control or manipulation in my life. I have no time for that and I believe I am worth more than that. I don’t stand for it, no matter what it costs me. And it has cost me a lot – lost ministry, friends, family members and much more. But, He is worth it. Jesus Christ is totally worth it. I like the ME that I am becoming to BE. This entry was posted in Uncategorized and tagged being you, believe, change, Christ, Christ in you, courage, creativity, grace, Holy Spirit, Jesus, journey, life, love, people pleaser, prophetic, religious props, seasons of change by riversofeden1. Bookmark the permalink. if more people could/would be so honest!!! I know this has to speak to a lot of people…oh this needs to be seen by so many!!! Thanks Cindy. I am not sure why except to say that it’s God. I feel so free. Timing in my season. I long to see people set free. I was soooo bound. Like to be in the dirt with people and love those underdogs. Love you. My wife would love to read this article, I’ll be sure to share with her. Thanks for posting! 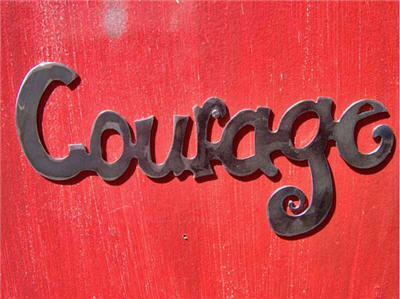 Courage we all face every day in our life. Some of us have more trail and tribulation though our life…but then some of us our given better tools to deal with it. You are so right. There are times of consistent trials that test us, especially to keep our joy. Thanks so much for the comment.